There is a lot of confusion about image quality, pixels, enlargements, and image quality. These days, virtually every professional photographer is using digital cameras for most, if not all, of their work, especially for aerial photos. High resolution digital images can produce amazing prints, even rather large ones. Print quality depends as much on how the original image is processed after production as it does on how many “megapixels” the camera sensor has. In almost all cases for quality prints, the image will be cropped, and very likely modified to some degree for ideal presentation. If a photo is taken with a wide angle lens, and then cropped down to get detail, you will lose resolution no matter how many “megapixels” the camera has. To get detail, it’s far better to zoom in with a quality lens so you won’t have to crop much later. That’s what I do. Many aerial photos are shots of large properties, landscapes, or scenic vistas, so they include a lot, but not much detail. Few individuals order anything larger than an 11 by 17 print. You can easily get sufficient quality for an 11 by 17 print from a camera that has at least 8 megapixels. My primary camera is 15 Megapixels, and I use quality lenses. Most static ( not video ) aerial photography does not depend on an image stabilizing lens because modern digital cameras have high film speed settings. The combination of fast “film” speed and a normal high quality lens produces a fast shutter action that captures a sharp image. Image stabilization is more important for shooting cinema quality video. Cinema quality aerial video is very expensive and requires a lot of planning and coordination. The proper way to do it is with a plane-mounted camera with a special image stabilizing system. Those cameras are extremely expensive. 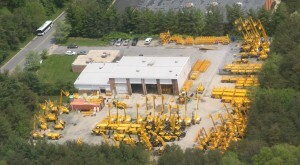 Many people like a fairly simple aerial video of their property or event. I can take HD digital videos of any property or event, up to 1 hour. 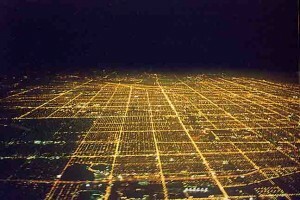 Chicago at night. That's a LOT of electricity being used.